The Robert who was active in Brookfield in 1706 seems is old enough to be the father of this Robert Emmons, but Temple suggests that there is only one. [Ref]. Dea. Benjamin Emmons was born in [1737?] in Brookfield. He died on or soon before 22 Apr 1811 in Hartford, Windsor, Vermont. He married Elizabeth Smith. Harriet Emmons was born in 1770. She died on 8 May 1817 in Woodstock. 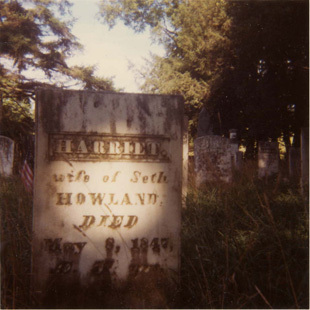 She married Seth Howland. Ancestry.com, New Hampshire, Marriage Records Index, 1637-1947, online database, Provo, UT, Ancestry.com Operations, Inc., 2011. Curfman, Robert Joseph, The Petty-Pettis Genealogy: Descendants of John Petty of Springfield, Massachusetts, 1668, Kansas City, unknown, 1985. Dana, Henry Swan, History of Woodstock, Vermont, Boston, Houghton, Mifflin, 1889. Gates, Horatio, The Aikens Monograph, privately printed, no date. No author, "Death Notices," Green Mountain Farmer, Bennington, VT, 22 Apr 1811. Randall, Oran E., History of Chesterfield, Cheshire County, N.H.: From the incorporation of "Township Number One" by Massachusetts in 1736, to the year 1881: together with family histories and genealogies, Brattleboro, Vt., D. Leonard, printer, 1882. Rhamy, Bonnelle William, The Remy Family in America, 1650-1942, Fort Wayne, Ind., unknown, 1942. Temple, J. H., History of North Brookfield, Massachusetts: Preceded by an account of Old Quabang, Indian and English occupation, 1647-1676, Brookfield records, 1686-1783, North Brookfield, The town, 1887. Wardner, Henry Steele, The Birthplace of Vermont: A history of Windsor to 1781, New York, Priv. print. by C. Scribner's Sons, 1992.